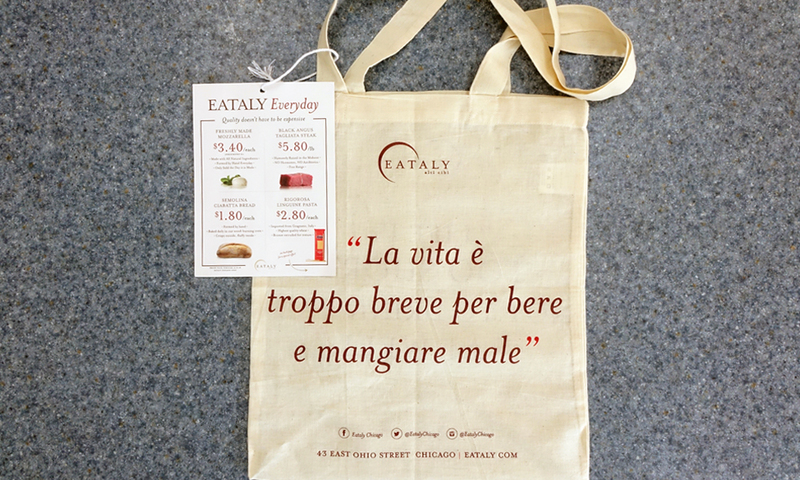 Welcome to our Spotlight Client of the Month – Eataly! 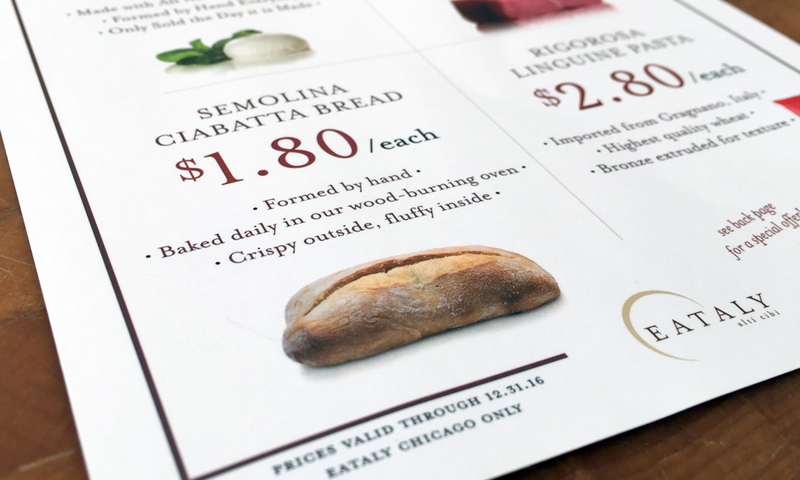 Eataly, the largest Italian marketplace in the world, contacted ummhumm | creative studio to promote their Chicago location with a direct mail campaign. 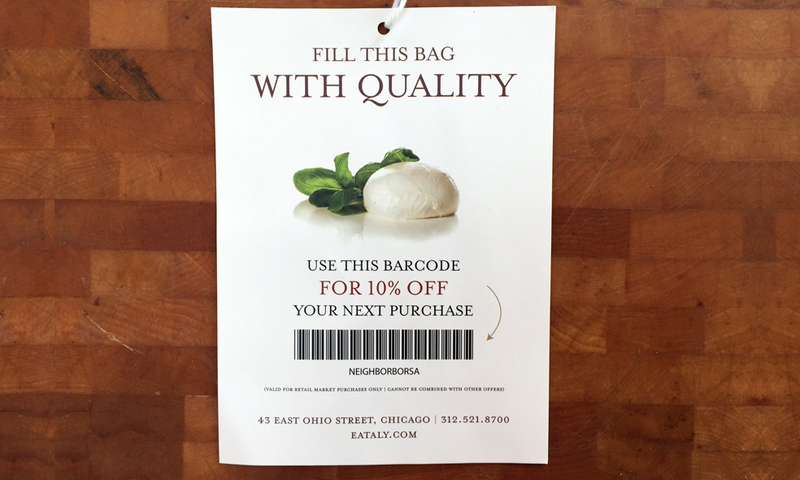 With a 10-part manifesto starting with “We’re In Love With Food”, we were very excited to offer our direct mail experience to get the Eataly word out. 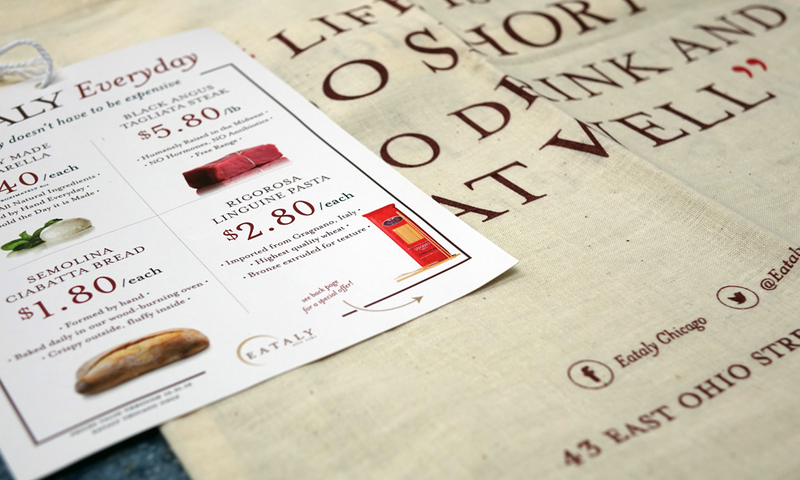 After a few creative sessions throwing ideas around on how best to achieve the desired result, we landed on a Tote Bag and accompanying offer card. 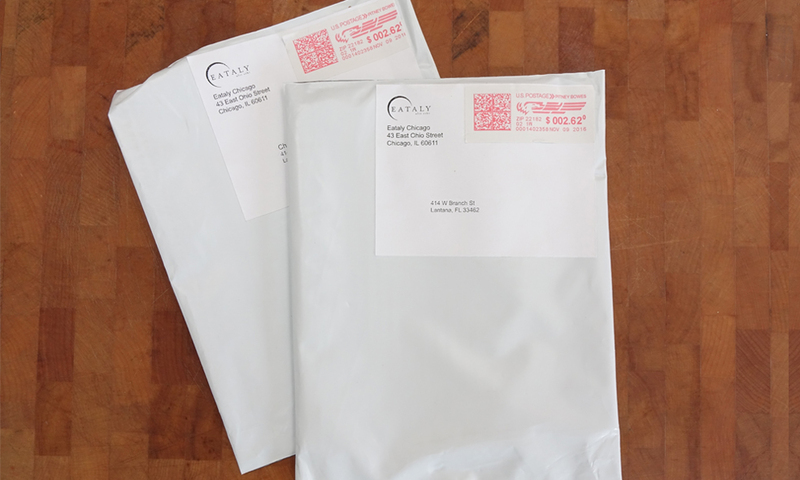 The Tote Bag and offer card were ordered and shipped to our partners in Virginia. From there, the bags were inserted into a white polybag. 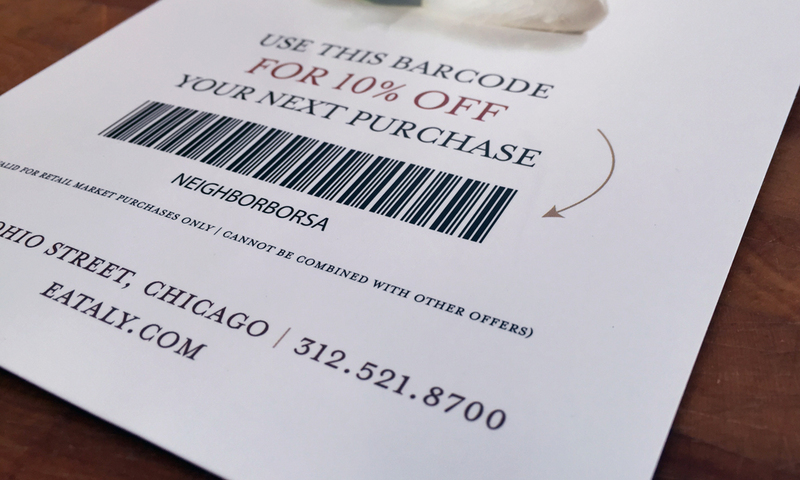 They were then mailed to 20,000 Chicago residents over a 4 week period. The results are still being tabulated, but as of December 31, 2016, there has been 429 new customers to redeem the coupon for a 2.145% response rate. 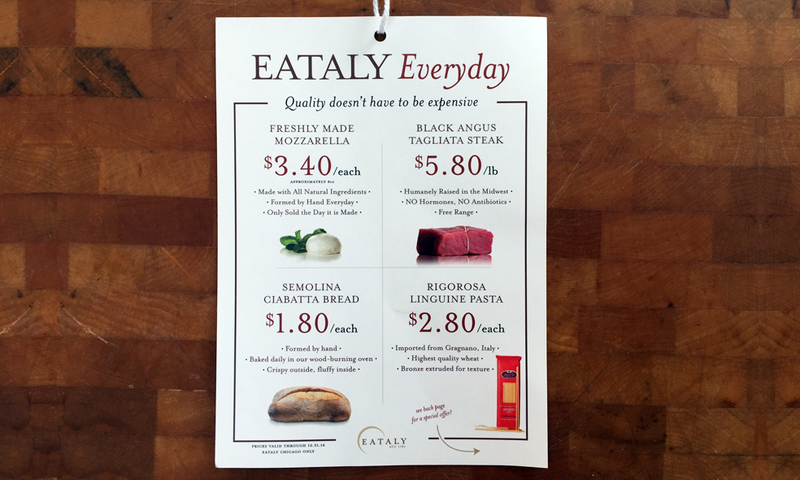 If you’re in Chicago, NYC or Boston, check out Eataly’s fine selection of Italy cuisine. You can also follow them on Facebook. Since the first opening in Torino, we have shared our love for high-quality Italian food and drink with cities around the world, from NYC to Tokyo. 1. WE’RE IN LOVE WITH FOOD. We love high-quality food and drink. We love the stories about it, the people who produce it, and the places it comes from. 2. FOOD UNITES US ALL. Good food brings all of us together and helps us find a common point of view. We believe that one of the greatest sources of joy is what happens around the dinner table. 3. OUR PASSION HAS BECOME OUR JOB. 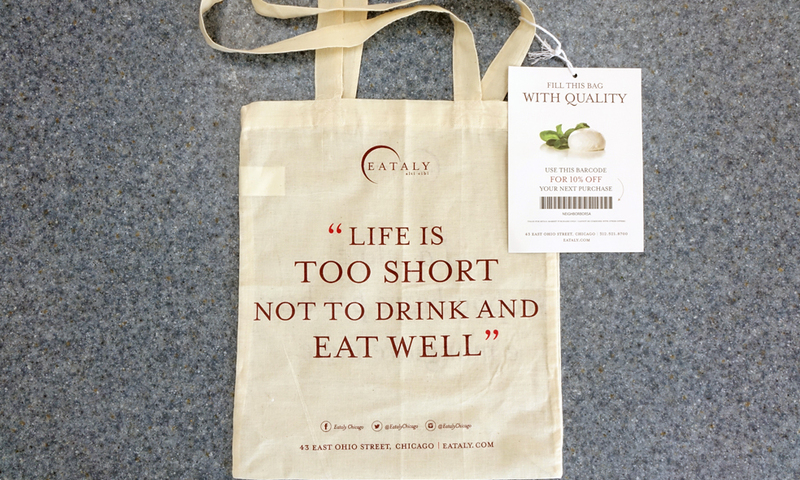 We’ve dedicated our daily lives to promoting a real understanding of high-quality food and drink. How lucky are we that we get to do what we love? 4. THE SECRET TO QUALITY OF LIFE? QUALITY PRODUCTS. By creating and offering the best products, we improve our own lives and bring added value to yours. 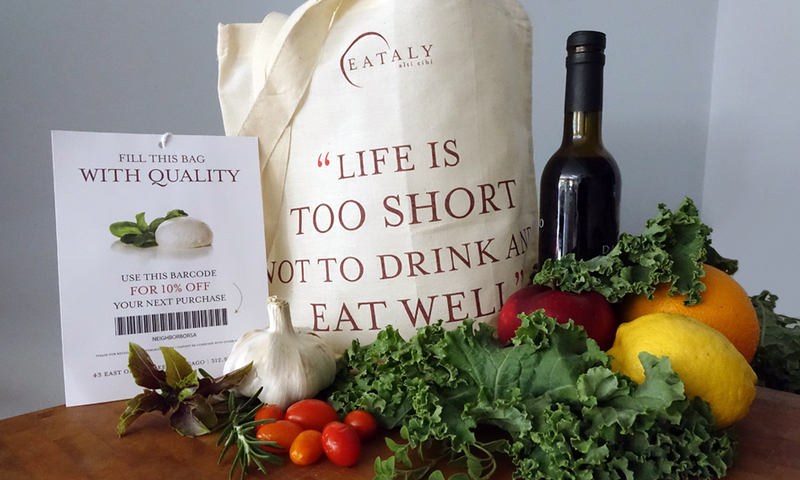 Enter a world dedicated to quality: that means quality food, quality drink, and ultimately, quality time. 5. OUR TARGET AUDIENCE IS EVERYONE. Whether you’re here to buy a loaf of bread, prepare for a lavish dinner, or sit down to enjoy a meal, we want this to be your place. We want you to be comfortable, happy, and enriched by every visit. This is a store with stories. Here, you won’t just discover what you love: you’ll also learn about what you love. 7. WE’RE IN THIS TOGETHER. 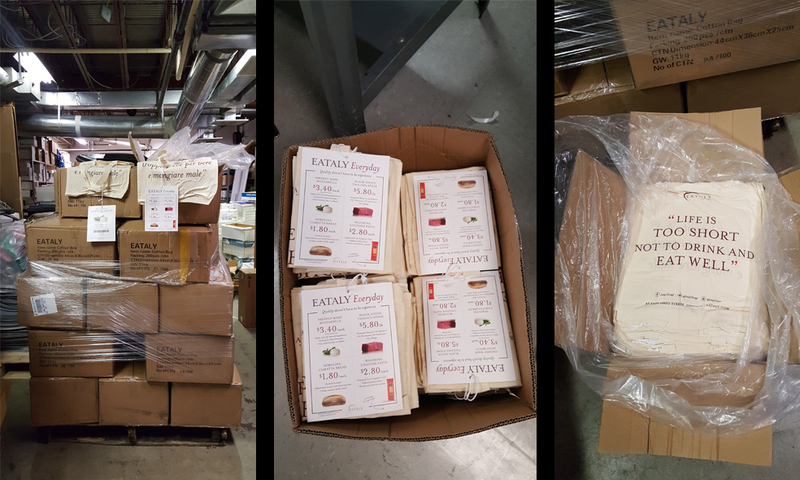 What you choose every day determines what we’ll stock on our shelves over time. When you demand quality products, you support the local farmers, fishermen, butchers, bakers, and cheesemakers who produce them. You create a better environment—for eating and beyond. 1. Choice: We offer a diverse selection of quality food and drink. 2. Accessibility: We are dedicated to offering the best products at the lowest possible price points. 3. Knowledge: We feel that it’s not just important that we know everything about what we sell and serve but that you also learn about the products we are so passionate about. We share with you the stories of the people and places behind all that we offer. The more you know, the more you enjoy. 9. YOUR TRUST IS EARNED EVERY DAY. In all ways, we promise to be scrupulously honest. We’ll never encourage you to buy more than you need or spend more than you can afford.